I always start the watch in January and this morning I saw them. 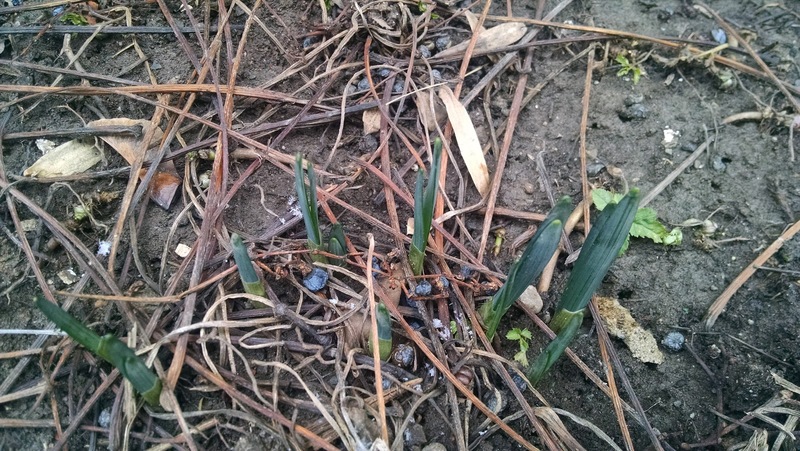 Those are the daffodil shoots in the picture. I do not expect anyone to be able to make them out. I can hardly make them out! Three years ago on Mozart's birthday, which is today, I was also writing about the daffodils. They are on my mind this time of year. Wow, looking back at that post, I can tell you one thing: My Christmas tree was a lot whiter then than it is now! The Christmas tree came with instructions not to put it in the window, because putting it in the window yellows it. That is pretty dumb if you ask me. Where are you going to put the Christmas tree if not in the window? Anyway my tree has gotten kind of yellow. But when the lights are on no one can tell. In 2011 the daffodils were later. It seems that I first saw them that year in February. 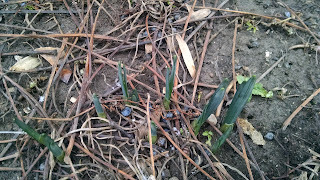 In 2010 it was March when I talked about the daffodils. That was the day I went to that snowy garage sale with my mom. I always remember that! In 2009 daffodils figured in my list of 10 Things I Do Not Understand. This is why we have Web logs.